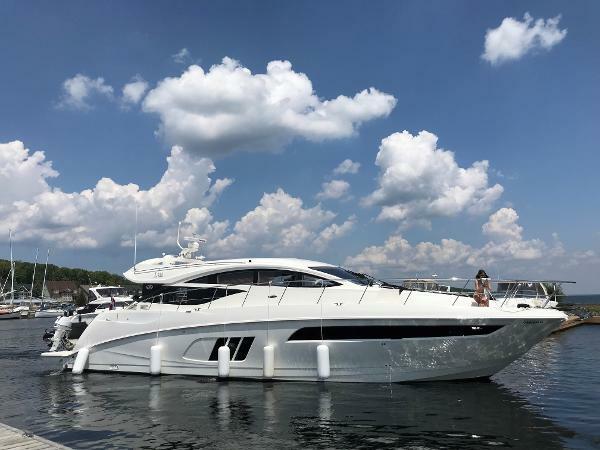 PRISTINE is one word you will continuously use when viewing this L Class 590 Sea Ray. 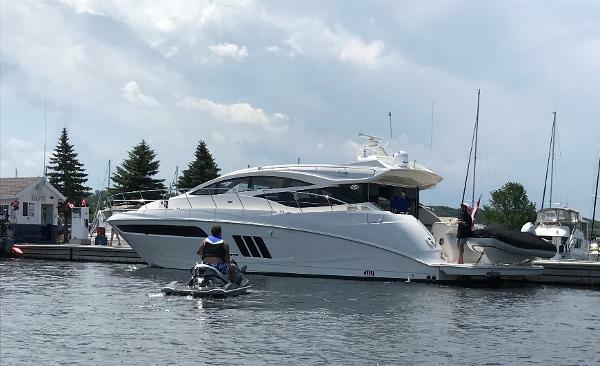 Sold new in July 2018 and cruised solely in the fresh water of Georgian Bay and Lake Michigan. Power is the Triple Cummins Zeus 600's which offer a remarkable cruising speed when desired. Virtually every factory option including a gorgeous interior, custom crafted by the Yacht Design Center. * Quarter Sawn Walnut and Matching Ultra Leather through Salon and Cockpit, Navigation aids include dual Raymarine GS 165 Radar/Plotter/GPS, Network Cameras (cockpit and engine room), Depth, Multi Station Docking w Cockpit Controls, Bow Thruster, Zeus Auto Pilot and Sky Hook Station Keeping. The onboard Chef will appreciate the Quartz Countertops, Under Counter Freezers w icemaker, Fridge, Dishwasher, Induction Stove Top, Wine Chiller and complete Sea Ray China Place Settings! Three private Staterooms (Two Private Heads w Separate Showers) along with a Convertible Salon Sofa, Stacked Washer and Dryer, Sat TV, 40" Smart TV and Bose Sound create a very comfortable family oasis. 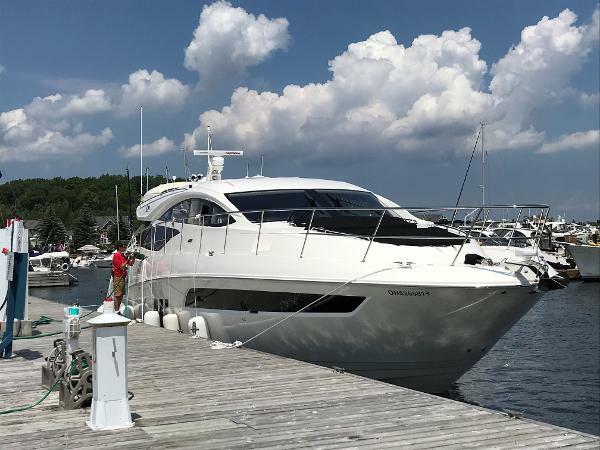 Outdoors is not to be outdone and features a Slide Out Gourmet Grill, Retractable Cockpit Sun Shade, Hydraulic Swim Lift, Bow Sun Shades, Bow Audio Upgrade and Windshield Privacy Covers. All tables onboard and outside are High Gloss Teak w covers. * Contact Agent for complete list of options/features. Stored inside a heated facility for viewing. Clean, quality late model trades will be considered. No Tariff charges to Canadian purchasers!